Gardening with native plants is as much of an artistic endeavor as it is ecological restoration. So what better place to find inspiration than the best teacher of all: the natural world! Nature is the best teacher we could ask for because it already has everything figured out. Millions of years of evolution have created the most efficient and productive systems that we as gardeners should strive to replicate in our own backyards. As gardeners we can turn to nature for inspiration for important aspects of gardening: Four season interest, compatible plant communities and planting structure. All we have to do is go for a walk in a natural space to observe and learn. Having four season interest in a wildlife garden is something that should not be over-looked. Four season interest not only makes a garden more aesthetically pleasing all year long, but provides important habitat for wildlife. When planning four season interest into a garden, we can take much inspiration from nature. Choose a natural area near you and observe it closely through the four seasons. There are always flowers in bloom to feed pollinators, ripe berries to feed the birds or fresh leaves for hungry caterpillars. This is because a healthy ecosystem never has a gap in its usefulness to wildlife - and neither should your garden. A garden that attracts wildlife all year long will never have a dull moment. By observing native plants in their natural settings, we can then replicate them in our gardens to create interest, and function, all season long. The seed heads of White Baneberry(foreground) and Blue Cohosh(background) add colour and wildlife value to a garden from late fall through to winter. Observing nature may lead us to discover new plant combinations that would work in our gardens. For example, look at a native meadow during the fall and you will be greeted by the incredible combination of yellow Goldenrods mixed with the purples of New England Asters. Not only are these combinations pleasing to the eye, but they provide bountiful nectar and pollen for late season and migrating pollinators. 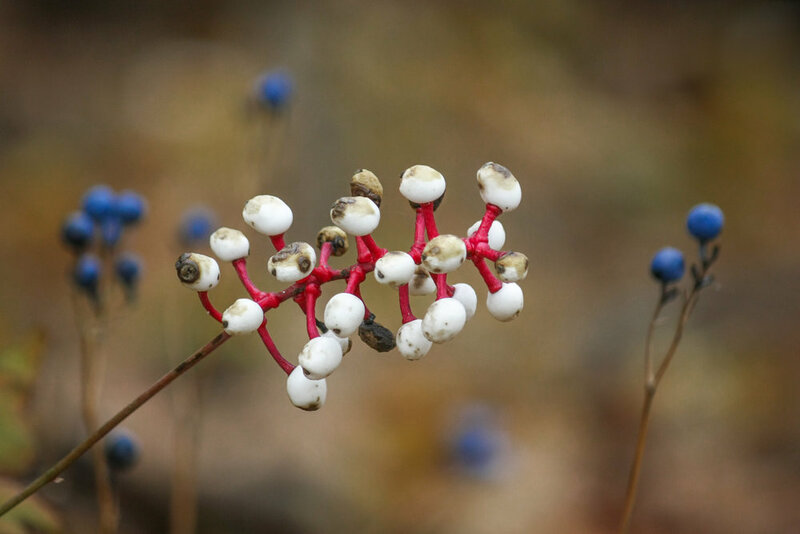 A walk through the woods in late fall may reveal the striking blue berries of Blue Cohosh mixed with the red and white seed head of White Bane-berry. These plants are often found growing together in the wild. Not only do they look good together, but both offer a great food source for wildlife and do very well in home gardens. There are many great plant ID apps for your phone that will make it easier to identify what you see out in nature and then find those plants at your local native plant nursery. Healthy ecosystems, such as this forest, have structure which we can mimic in the garden for many benefits. Look at any healthy ecosystem and you will find structure. Structure is important in a garden not only for aesthetics, but also to provide the highest quality habitat for wildlife. In nature you will notice different heights and layers of plants in a healthy ecosystem. This means that every available niche is filled which supports the most amount of biodiversity. This is a great goal to strive for in a wildlife garden because it allows us to get the most out of our space both aesthetically and functionally. An example of planting structure based off a natural system is that of a woodland setting. Walking through a healthy, mature forest you will notice a canopy layer(largest trees), sub-canopy(smaller trees), under-story(shrubs) and a ground layer(ground covers, ferns, grasses ect.). Benefits of replicating the structure of natural systems includes increased value to wildlife, fewer weeds and increased aesthetic composition. Next time you go for a walk in nature, notice the different layers of plants growing around you and try incorporate similar plant composition and structure into your garden to benefit you and the wildlife alike. Nature can provide us with a lot of inspiration in our gardens. All we have to do is pay attention. Simply taking a walk through nature can inspire you to add four season interest to your garden, discover exciting plant combinations and add structure to your garden. The best part is that there is inspiration to be found during any time of the year!